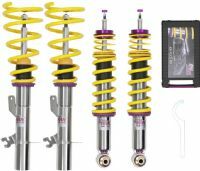 A great way to increase handling, performance, and style is by upgrading the suspension on your CTS-V. ModBargains.com offers everything from full coilover kits and sway bars to sub-frame connection braces and bushings. Whether you are looking to lower your car for looks or for the track, ModBargains.com can hook you up. We work directly with manufacturers such as KW Suspension, so we always try and bring you the best in quality, and we also keep parts in stock, making shipping that much easier. Our in-house master technicians can also install your suspension mods for you, and before every shipment/install, our quality assurance team looks over every part (an industry standard). Our CTS-V specialists can help you get the suspension parts you need for your driving style. Give us a call, and we can set you up with what you need to get your desired ride height or handling. 714-582-3330, call and save on CTS-V Suspension parts today!